View, over construction fences, from North Atwater Park. Seating and viewing areas in the foreground. 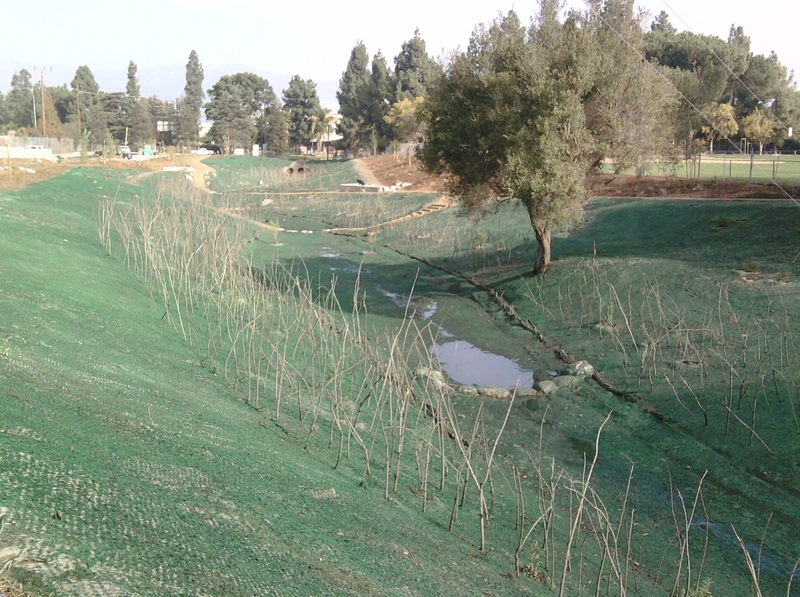 Central green creek area has been hydroseeded. In the distance is the new mostly-permeable-surface parking lot. I got a chance to look over the fences at the under-construction natural creek park at North Atwater Park. Officially the project is called North Atwater Park Expansion and Creek Restoration. It’s looking like it’s 99%+ complete… though it will be good for the native vegetation to grow and get itself more established during the cool wet season ahead. This view immediately left of the above image. The L.A. River is just outside the frame to the left. The formerly-straight channel-wall-top access road has been given a meandering curve. The creek in the right side of the image drains into the L.A. River just downstream of the photo. I was glad to see that this good-sized oak tree was preserved. The bare sticks in the ground I think are willows. There's just a bit of water in the creekbed today, probably from recent rains. The creek feature is fed by street runoff and expected to be intermittent - dry in the summer, wet only during and after rains. Looking forward to the park opening… fairly soon! Very promising project. Will drop by in the spring probably to check it out. Looks nice. But. 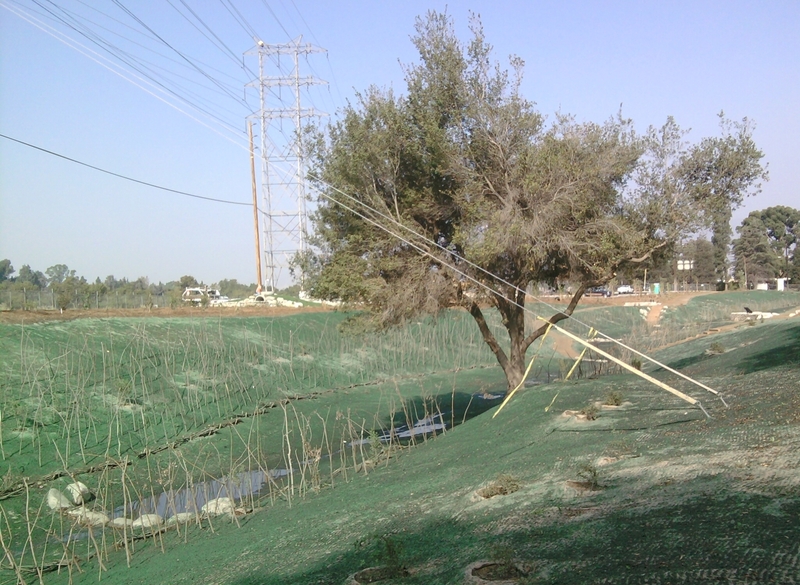 Every native habitat project that has incorporated hydroseeding has been a maintenance nightmare. What’s it gonna take for that lesson to sink in? The construction will be complete by January, 2012. There will be a grand opening in April, 2012. The establishment/maintenance period for the hydroseed in the creek will end in December, 2012. During that period the park portion will be open but the creek slopes and bed will be fenced off to allow the vegetation to establish. Awesome, Nishith! Thanks for the the timeline… I hope you’re really proud of this project. It looks great, but I don’t get exactly where it is. Your caption is clipped – in my browser, anyway. The park is located at the north end of Atwater Village – across the L.A. River from Griffith Park – near the L.A.-Glendale border. It’s north/upstream of the Los Feliz golf course, south/downstream of Colorado Blvd – basically at the end of Chevy Chase Drive. I live at Brunswick & Chevy Chase…. and had no idea this was being built. Thanks Joe. I’ll check it out. is that the bike path? The official bike path is on the west side of the river, and this project is on the east side. On the east, there’s just an access road, which is used by peds, cyclists, equestrians, and occasional maintenance vehicles. 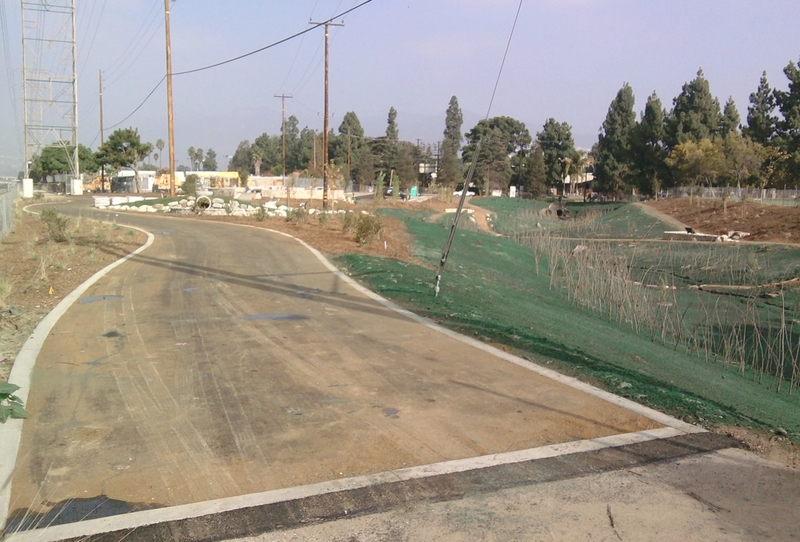 There are miles and miles of access roads adjacent to channelized creeks in LA, often on both sides of the creek. Most have locked gates preventing access, but I wonder where else they are being used as biking/walking paths. One creekside official bike path in the West Valley, Brown’s Creek, doesn’t seem like much more than an upgraded access road opened up for… public access. I wonder how/why that got built and how much it cost, and what issues, besides the obvious,ubiquitous and overplayed ‘liability concerns’, prevent more of them from being opened up to use as is. Brendan – We creek freaks definitely agree (if I can presumptuous enough to speak for anyone other than myself) let’s open the gates, create more access… but you probably want to let the mayor, your councilmember, your county supervisor know… they’re the ones who get projects like Brown’s Creek funded and built. Bike paths are roughly $1M per mile, plus additional costs for grade separation, like crossing under bridges. There’s some money for these available from Metro, State and Federal pots… but the elected officials need to hear that you and your neighbors want these. It will take some weeding in the early maintenance. But hopefully the hydroseed will germinate and with some maintenance help will outcompete the weeds eventually. It can be difficult but it is one of the best ways to get a diverse comprehensive habitat matrix. We developed a maintenance manual for the native plants in the park for Rec. & Parks and two training sessions (Spring and Fall) to help their personnel distinguish native plants from weeds and establish their maintenance requirements. Once the 1-year maintenance is complete, the City should have enough understanding to keep the native plants going. We are trying to understand from the previous lessons of native plant and hydroseed installations…and hoping for the best. 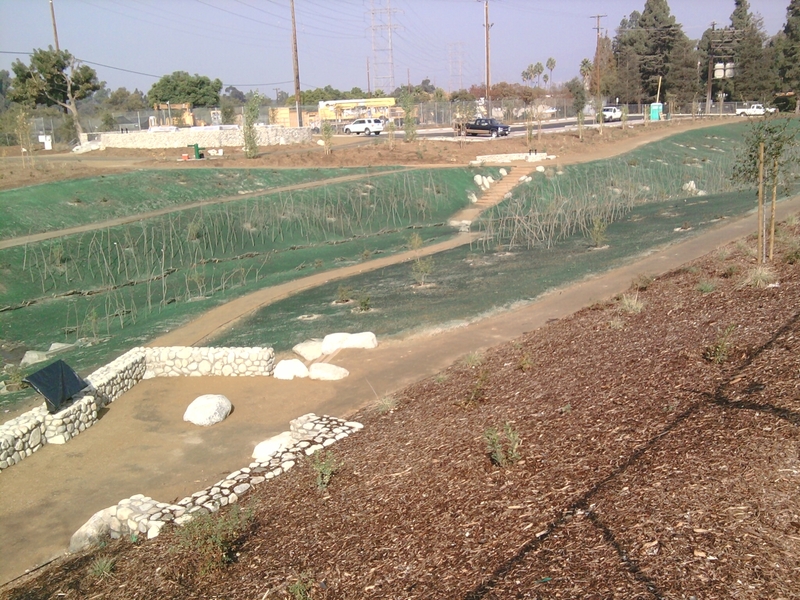 You are currently reading North Atwater Park Creek Construction Nearly Complete at L.A. Creek Freak.